Seven old-school Sugar Pie DeSanto songs, three Filipino folk songs and a lot of traditional blues. Out of Delano, Calif., youth mariachi band Mariachi Mestizo, led by Juan Morales, will release “Te Doy La Libertad.” Sixteen boys and girls between the ages of 9 and 18 sing and play their hearts out for a vintage sound. Closer to home, Pugh has worked with two artists who are keeping blues alive. Aki Kumar grew up in Mumbai, formerly Bombay, listening to his father’s eclectic music collection and his mother’s sweet singing around the house. He enjoyed rock ‘n’ roll and popular Bollywood songs and studied traditional Hindustani music at a young age. Despite mastering the harp, Kumar didn’t really listen to the blues until he emigrated to the Bay Area to attend San Jose State University at 18. 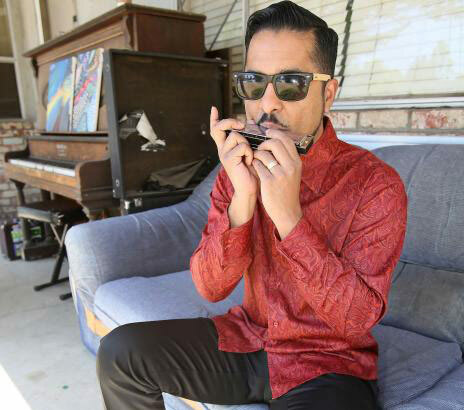 “There was harmonica involved (in Bollywood) but it wasn’t dominant…to me that was the role of harmonica,” he said. After listening to recordings of the greats, he began hanging around in local blues clubs and was soon working as a software engineer by day and playing venues at night. “I started to realize how much influence Western pop had on Bollywood and when I got into blues those things started to pop out,” he said. And from that realization, a fun fusion emerged. He didn’t set out to be “musically deep” but wanted to make two important genres in his life connect for his upcoming release “Aki Goes To Bollywood,” where deep blues marries mid-century Bollywood. “I was freaking out at first because I didn’t want to force things together,” the former tech guy said. The result is a blend of sitars with blues jams, Hindi vocals and Kumar on the harp. John “Blues” Boyd, who lives in San Mateo but records with musician Kid Anderson in San Jose’s Cambrian neighborhood, grew up singing in the cotton fields of Mississippi in the town of Greenwood. He and his late wife Dona Mae Moore packed up for the Bay Area in the 1980s, and Boyd became a hot tar roofer. His wife knew it, though, and persisted that he start up a band. He finally did so around the age of 60. Then her health began to take a turn for the worse. “When I put the band together I would rush home from sessions to take care of her,” he said. He naturally turned to blues when his wife of 49 years died in 2014 and began writing songs. He’s written about 100 of them since.